The owner of this house wanted to build a purpose-built home to meet the needs of his growing up family. He wanted to live in the village he grew up in but at the same time it was important that the design embraced new concepts and ideas. The end result is a stunning contemporary luxury home that incorporates large glazing areas throughout. There has been a careful use of traditional stone, wood and also unique metal cladding detail with the external design. Internally the feeling throughout is minimalistic clean lines, with the furniture being a perfect complement to the end result. With the exception of the switchable privacy glass for the window adjacent to the front door, the inclusion of completely concealed fully automated blinds to all other windows are the ’Grand Finale’ to this beautiful home. 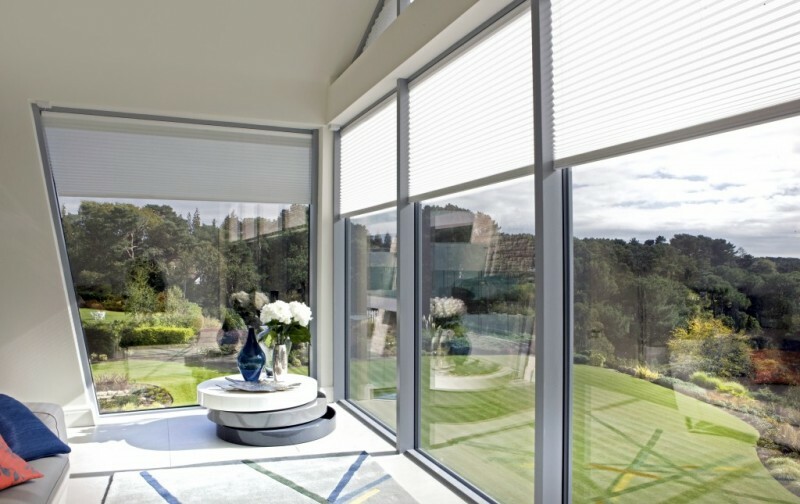 When not required the blinds are completely concealed but at the press of a button or using their mobile devices, blinds appear as required – providing shading, sun protection, privacy or blackout blinds as required. A feature of interest is the large gable window in the master bedroom. Here Honeycell Duette® blinds have also been concealed within the sloping ceiling and again appear from their hiding places when required showing that irregular shaped areas can benefit from the Blindspace headboxes which can be made to conceal almost any blind available on the market.